I loved this review; thorough and thoughtful! It’s back-to-school time. As a former teacher and school principal, I know it’s easy for the most important things to get lost in the rush of new schedules. 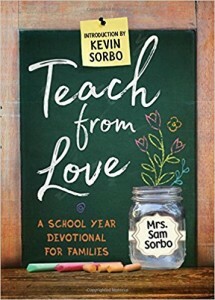 But Sam Sorbo has made it easy for families and teachers to put first things first with her new devotional book Teach from Love: A School Year Devotional for Families. The author of They’re YOUR Kids: An Inspirational Journey from Self-Doubter to Home School Advocate, Sam Sorbo has devoted her energies in the last several years to encouraging parents to be intentional about their children’s education. Her latest book is a handy devotional tool for families and teachers alike—Teach from Love: A School Year Devotional for Families. 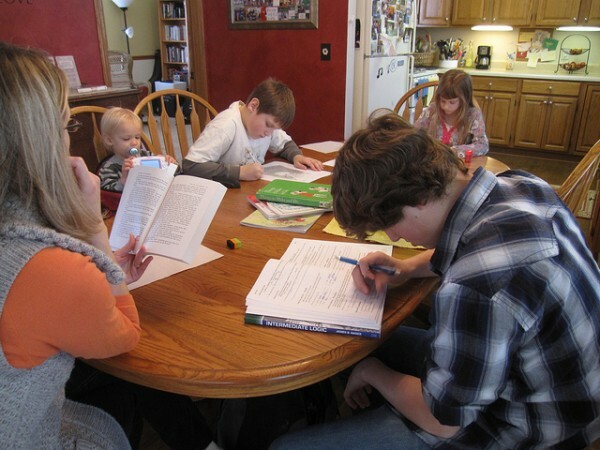 Like our family, Sam and Kevin made the transition to homeschooling, but this new devotional shouldn’t be restricted to the home-schooling arena. It’s the perfect tool for Christian school teachers to use in the classroom to set the tone for the day and instill godly character qualities in their students. Godly character qualities is what this devotional is all about. Sam has chosen 72 character qualitiesany Christian would want to demonstrate. The two character qualities are unpacked throughout the week through engaging stories, biblical examples, and thought-provoking questions designed to engage kids—and keep them thinking about what matters most as they go about their days. Engaging story, example, or lesson. Simple prayer for the day. How long does it take? No more than 15 minutes each day. Jimmy left the grocery store and noticed a wallet lying on the ground. It had money in it and an ID. He’d spent more on groceries than expected and that money would help make ends meet. He could pocket the money without anyone knowing, but having moral excellence, he chose to return it all to the store. He knew the money wasn’t his to take. Sometimes doing the right thing doesn’t pay, but it does make you feel good. The Holy Spirit grants a feeling of peace over the situation. Circumstances arise daily, both at home and at school, when you must make a choice about whether you will have integrity or indulge in self. Living a virtuous life means not choosing to take a shortcut when running a race, letting a clerk know if they haven’t charged you enough, cleaning up messes you are responsible for creating, and owning up to the mistakes you’ve made. Having integrity is choosing the right thing even when no one is watching. Sometimes that choice is the hardest to make properly. Many voices in society today urge us to serve ourselves instead of our heavenly Father. Jimmy made the strong choice to do what was right in God’s eyes, to honor Him before self. Choose moral excellence; your reward is eternal. Father, please help me honor you in all my decisions through the power of the Holy Spirit. When was a time when you had to choose integrity or self? How does having moral excellence create an eternal reward? Simple—but focused on what matters most. Sam Sorbo has done all of us parents a great service. We plan to use this valuable devotional ourselves in our own family of six homeschooling children as we re-engage organized learning this time of year. I highly recommend homeschooling families and home-schooling co-op leaders pick up a copy to prepare for a successful school year. But Christian school teachers should grab a copy, too. Even if you don’t use it every day, most of you have times scheduled with students where you could use a ready-made devotional focused on character qualities. I encourage you to pick one up for yourself and for your school administrator so he or she can know what you’re doing and perhaps share it with other teachers, as well. Parents and teacher, be intentional. Teach from love. Start each morning with this superb school year devotional.